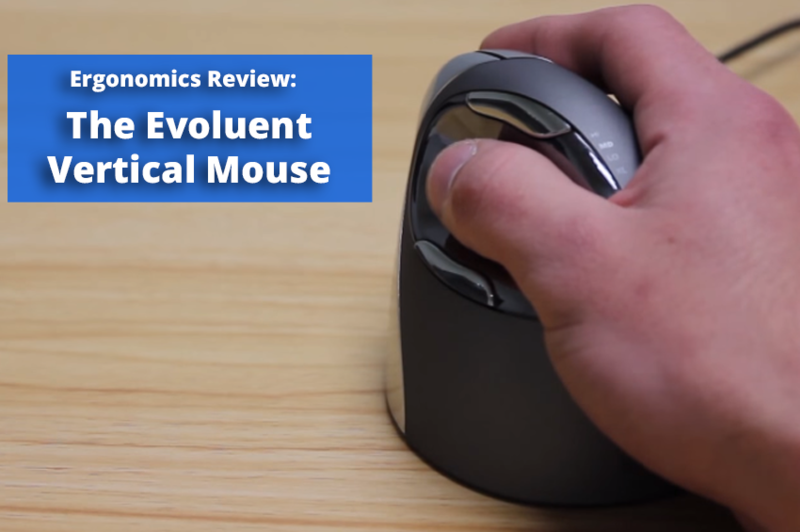 Ergonomics Review of the Evoluent Vertical Mouse - Solutions Northwest, Inc. There are many different versions of vertical mice. Over my years doing ergonomics assessments for office workstations, the best vertical mouse, in my professional opinion, is the Evoluent Vertical Mouse. We have not been compensated in any way for writing this review. The opinions expressed are our own. At Solutions Northwest Inc., we believe the overall feel of a piece of equipment is very important. The Evoluent has a very natural feel and puts the wrist in a very good neutral position. This mouse comes in left-handed and right-handed versions. Some products are made to do both but they don’t seem to fit the form of the hand as well as a dedicated left/right product. This vertical mouse comes in different sizes. Have you ever used something that’s too small or big for you? If you have, then you know how uncomfortable that can be. A mouse which is the wrong size for you can cause unnatural posturing of the hand and wrist which are risk factors. So if you must mouse, an Evoluent Vertical Mouse is an option we recommend. Remember to always consult with your doctor to rule out any possible underlying cause of pain. And be sure to communicate with your staff, co-workers, or office managers/admins to see if they’d like to try any of these products.